Guardian Heroes is a 2D side-scrolling beat ’em up video game in the vein of Final Fight or Golden Axe, but with RPG elements. The development team called it a “fighting RPG”. Guardian Heroes was developed by Treasure and released in 1996 for the Sega Saturn video game console. 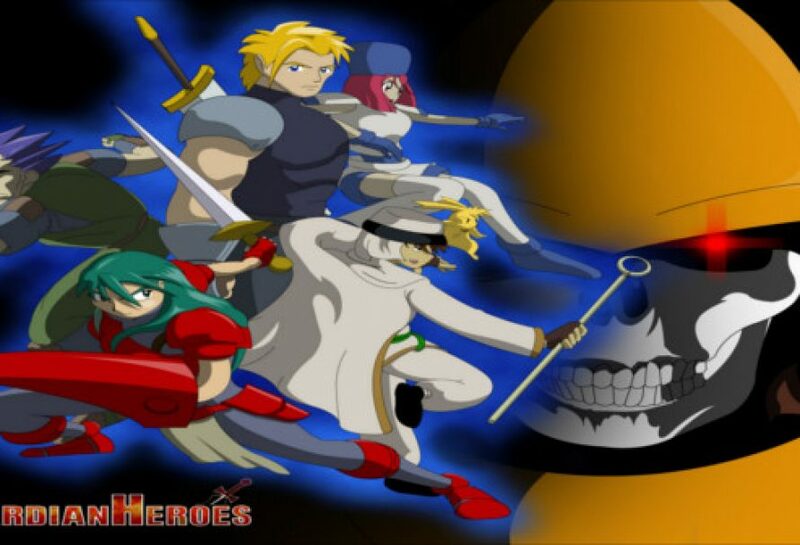 A sequel was released in 2004 for the Game Boy Advance entitled Advance Guardian Heroes. The game allows players to alter the storyline through their actions, such as choosing between a number of branching paths, leading to multiple endings, and killing civilians and enemies, leading to changes in the Karma meter. The music was composed by Hideki Matsutake, a former member of electronic music band Yellow Magic Orchestra, and Nazo Suzuki. It is sometimes considered a cult classic of the beat ’em up genre. The players earn experience points during each scene, and between scenes are able to improve and customize their characters with six attributes: Strength (determines physical damage per hit and distance enemies fly when the player hits them), Vitality (determines HP), Intelligence (governs size and strength of spells), Mentality (determines how many MP the player has and how fast MP are recovered), Agility (determines the speed at which characters can do physical and magical attacks) and Luck (modifies damage the player gives and receives, in addition to improving Nicole’s selection of spells). The game’s story mode has multiple paths. The player can choose where they will go and what they do after every level. Different paths lead to different endings, bosses, and levels. The battlefield has multiple levels. Initially, the player can only access three planes of battle: a foreplane, a middle plane, and a back plane. These planes can be switched between in set sequence, or at the player’s choosing based on which button is pressed. Often, evasive actions can be taken by switching a plane. 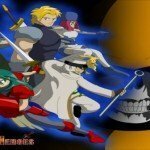 One of the human wizards, Kanon, escapes his imprisonment with the Earth Spirits, and comes back to the surface to get his revenge on the Sky Spirits. There, he brings his case up with the existing khans. Since they do not trust him, he destroys them and replaces their kingdom with a wizard kingdom, with puppet khans to do his will. The former king prophesied, prior to his death, that should his reign and the Time of the Sword be brought to such an end, then the sword would resurface and in turn bring an end to Kanon’s reign. As a precaution, Kanon banishes every existing sword in his new kingdom, but he overlooks one particular sword, belonging to a fierce, anonymous warrior who fought to the death during Kanon’s takeover. Also, the former princess Serena survives the ordeal, and joins the band of knights to try to bring about Kanon’s end from the inside. At the game’s start, four warriors – Han, Randy (with his pet rabbit, Nando), Nicole and Ginjirou – find the sword of the valiant warrior. Serena arrives to warn them that the knights have learned of their possession of the sword, and are coming to take it back. The four flee their home as it bursts up in flames during the invasion, then escape the town via separate ways, rendezvousing at the graveyard nearby. The leader of the Black Knights, Valgar, awaits them there, accompanied by a powerful robotic warrior. They are unable to damage it with normal weapons, and Han resolves to use the new sword against the robot. The sword is struck by lightning, electrocuting Han and causing him to lose his grip on it. The sword then floats over to the burial mound of its original owner, who rises up in zombie form. Enraged, he obliterates Valgar’s robot, and attacks Serena. However, the five discover that the warrior obeys any command that they give. They resolve that, with this new ally, the time to begin an attack on Kanon’s new kingdom is at hand. Next article Check Out The New Creepachu!